Delicate in appearance but durable in reality, the Ario Dining Table will enhance any contemporary dining space. The solid iron base furnishes an intricate design of different shaped holes to render a stained glass effect, while the oval top is built of solid acacia wood to supply long-lasting strength and use. Displayed on its own or paired with other pieces from the Ario collection, this table is sure to create an interesting focal point in any interior setting. Do you have enough room to stretch your legs out? On the ends this would be possible, but not so much on either side of the table. Is the metal base two separate pieces? Also is the finish on the base more of a silver or gold tone? 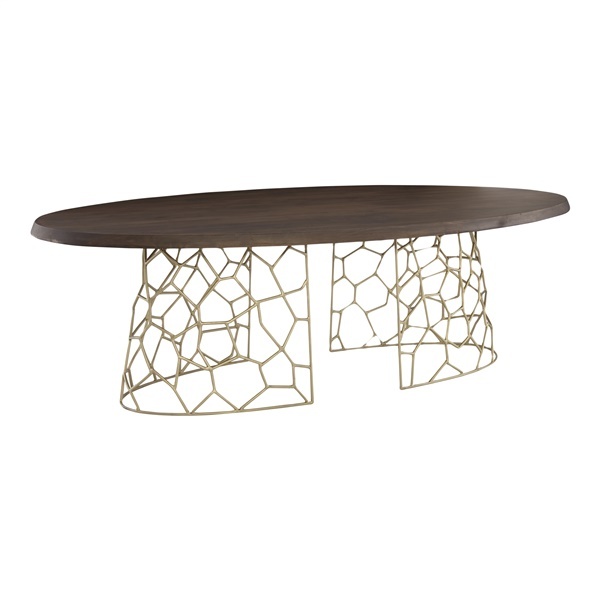 The Ario Dining Table base is 2 separate pieces. It is made of iron and has a gold coloring to it. Is the base of this Ario Dining Table separate from the table top? Is it possible to move the 2 pieces of the base closer together & use a smaller table top? Thank you! The table top for the Ario Dining Table connects to the base with screws. In order to move them closer you would have to drill new holes and it is not recommended as it would void any warranty.